BFST® is the treatment you need to finally heal and feel better. The products and treatments discussed below ARE intended to prevent, treat and heal soft tissue injuries and their related pain. The products below ARE FDA registered medical devices. What is a Cold Laser? Cold Laser Therapy, or Low Level Laser Therapy (LLLT) is when a low-level powered laser is used for therapeutic purposes. These lasers are utilized with handheld devices, called cold laser units or low level laser units. During a treatment, the laser is pointed directly over the affected area. The manufacturers of these home laser devices claim that these lasers will heal soft tissue injuries. With few exceptions, this is simply not true. A typical cold laser unit will not heal your soft tissue injury. Cold laser units for home use do not cover enough of the injured area or output enough energy to heal you. Home cold laser units simply aren't as powerful or as effective as BFST® devices. BFST® is the ultimate solution for healing your soft tissue injury quickly and completely. BFST® provides more than 1000x the power of a typical cold laser unit. The Energy Web® of our BFST® device has an energy output of about 10W, while a cold laser unit only has an energy output of about 0.01W. This means BFST® devices operate at levels that are low enough to be extremely safe, yet high enough to be extremely effective. Cold laser units operate at such low levels that they have no healing benefits whatsoever. 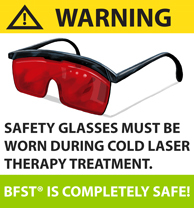 BFST® covers 5000x the area that a cold laser units does. The Energy Web® of our BFST® device covers about 50-100 sq inches of area, depending on what part of the body you are treating. A cold laser unit only targets about 0.01 sq inches. A cold laser just points a small dot on your skin and will do nothing to heal your soft tissue injury. BFST® devices are affordable and will last through thousands of treatments. 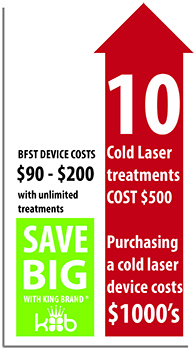 BFST® devices cost between $90-200 per unit while only 10 cold laser treatments will cost you $500 or more. If you want your own cold laser unit to use at home, these can cost several thousands of dollars. BFST® makes recovery much more comfortable and convenient. Cold laser therapy is very inconvenient. With BFST® you can easily treat yourself at home whenever you want. You don't have to bother going to your physiotherapist or chiropractor to get a treatment like you do with cold laser treatments. You can use BFST® in the comfort of your own home and get much better results than you would with a cold laser unit. Wear a ColdCure® wrap as much as possible. This will protect the injured area from further damage while you heal. Whenever you need additional pain relief, swap out the RigiGel® with one from the fridge or freezer. Treat yourself with BFST® first thing every morning. Treat yourself with BFST® 2 or 3 more times throughout the day. This will help you heal quickly. Avoid re-straining the injury as much as possible. Giving your body a rest is hard, but it is very important in the early stages of healing. Do this and your soft tissue injury can truly heal - Finally. The healing benefits of BFST® technology can't be found anywhere else. BFST® will heal your soft tissue injury more quickly and effectively than any other product on the market. Nothing else comes even close to our innovative devices. There is a BFST® wrap designed specifically for each part of the body. With cold laser units, all you have is a tiny dot pointed at the general area of injury, but with BFST® you have a device that conforms to the shape of the body part and covers your entire injury. There are wraps for the Ankle, Back, Elbow, Foot, Knee, Leg, Shoulder and Wrist. Whether you are suffering from a chronic condition or a soft tissue injury, there is a BFST® device that can help you heal. BFST® is ideal for treating conditions such as Carpal Tunnel Syndrome, Tendonitis, Plantar Fasciitis, Shin Splints, etc. BFST® can also help heal strained and torn ligaments, muscles and tendons in all areas of the body. You should also know that BFST® is extremely safe therapy. With cold lasers units, special glasses must be worn to protect the eyes during treatment. BFST® devices require no such protective equipment. You can do the treatments and not have to worry about your safety, unlike with a cold laser unit. BFST® treatments allow you to multitask. With cold laser treatments you have to sit very still and can't do anything but receive the treatment. The BFST® device allows you to simultaneously receive treatment and do any of the usual activities you would do while at rest. You can receive a treatment and watch television, surf the internet, read a book, etc. It's important to understand that BFST® is designed to stimulate blood flow to accelerate healing. While it may be therapeutic in terms of pain relief for people with certain conditions, it is not designed to reduce swelling or pain. BFST® should be used during times when your injury is stable - meaning there is no significant pain or inflammation in the area. You need to use cold compression therapy if your injury is significantly painful or swollen. Manufacturers of cold laser devices claim that they help with pain and swelling, but this isn't the case at all. Cold laser treatments do nothing to eliminate swelling and pain. The number one safest and most effective treatment of pain and swelling is our ColdCure® wraps. 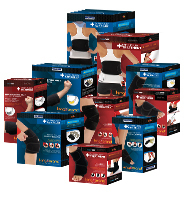 ColdCure® wraps applied to the injured area provide you with both cold and compression. It's cold and compression that are going to work the best to reduce the inflammation and pain as quickly and effectively as possible. 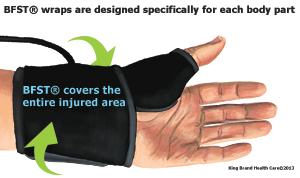 Just like with our BFST® wraps, King Brand® manufactures a ColdCure® wrap for each part of the body. You don't have to wait. You can heal your soft tissue injury at home quickly and completely with the right treatment. King Brand Healthcare Products® are the proud innovators of Blood Flow Stimulation Therapy (BFST®). Blood flow brings oxygen and nutrient-rich blood to the injured area - a requirement for the body to heal itself. Unfortunately blood flow is restricted while the injured body part is at rest, which in turn limits the body's ability to heal. Physical activity will promote blood flow but all too often it also results in minor but frequent re-injury. This extends your healing time and greatly increases the amount of scar tissue that develops within the soft tissue. With a King Brand® BFST® device, blood flow can be stimulated in the injured area deep below the skin area while you're at rest. With improved blood flow, and without physical activity and the risk of re-injury, you can recover from your soft tissue injury at a rapid rate. 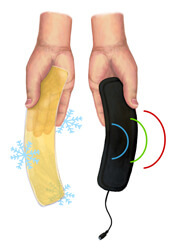 BFST® devices are NOT heating pads. BFST® stimulates blood flow throughout the entire injured area while you are at rest. This is very important because while at rest, an unaided and inflamed injury can otherwise have seriously impeded blood flow. It is the oxygen and nutrient rich blood that enables the healing process, so adequate blood flow is required for the soft tissue to heal properly and quickly. BFST® wraps have 3 different power settings so you can continue to increase the power of your treatments as your injury heals. BFST® treatments are very pleasant. You will experience a slight warming sensation that is very soothing and relaxing. During your first treatment, your injured body part and the area around it will feel quite warm. This is because at first, your circulation is poor. The more you use the device, the less warming sensation you will feel. This is good. As the warmth lessens from treatment to treatment, this is an indication that the circulation in your injured area is improving. Better circulation means more blood flow all the time, not just during treatments. This is the goal. When you feel very little warmth during a treatment, it is time to move up to the next power level. Don't rush it though, more heat does not mean better treatment. In fact, less heat means better treatment, so take your time moving up in levels. The promotion of blood flow has obvious benefits. The reminder of the injury though is incredibly important too, because avoiding re-injury is fundamental to rapid recovery. The BFST® device is designed to be worn even when turned off to help protect your body part from re-injury. This goes a long way towards shortening your recovery time. Patients enjoy the support and cushioning BFST® wraps provide and appreciate that they are healing their injury - patients like wearing them, they know its helping them heal. This positive attitude further contributes to an overall positive recovery. Cold laser units don't have any of the above features or benefits. This is why BFST® is a superior therapy and cold laser units are simply a scam. Don't just treat the pain - heal the problem forever. Professional athletes are the best example of how quickly people can really recover from soft tissue injuries. When a professional athlete pulls or tears a muscle, tendon or ligament, they have explicit instructions to rest the injured area - no physical activity, crutches - they are ordered to rest the injury completely. Injured professional athletes though also are attended to by professional athletic therapists. These professional therapists have always been assigned to the athlete to ensure they supplement the healing process, to stimulate blood flow many times each day. Regular BFST® treatments are a standard part of that therapy because the more we promote blood flow, the faster we will heal. That's why professional athletes are back in the game in days while regular patients with the same injuries often take weeks or even months to heal. With the addition of BFST®, pro athletes and others who use it are recovering from their soft tissue injuries faster than ever. Combination Therapy means using ColdCure® and BFST® in combination by alternating treatments. Combination Therapy is much more effective than using just ColdCure® or just BFST®. This is because you're getting both the pain and swelling relief of ColdCure® and the healing benefits of BFST®, resulting in the absolute best treatment for your injury. Use the ColdCure® wrap for at least 2 straight days before using the BFST® wrap. This will help reduce not only the visible swelling you may see on the surface, but also the inflammation you may have and cannot see, deep down in the soft tissue. Avoid using the BFST® wrap until your inflammation and swelling has subsided. Start your BFST® treatments on Level 1. For maximum benefit, please take into consideration that each 20 minute treatment optimizes your blood circulation for an average of 4 hours. We recommend 3-4 treatments daily, spread throughout the day. During the day, do a BFST® treatment every 4 hours or before any type of physical activity. This can include anything that puts a strain on the injured area (walking, standing for extended periods, etc). This can also be used for preventative measures after a full recovery to optimize your blood flow. Do a ColdCure® treatment any time you experience a pain flare-up or after any physical activity to prevent further injury and reduce swelling and inflammation. 30-45 minutes after your ColdCure® treatment, follow with another BFST® treatment. This time will allow the blood flow and body temperature to regulate again. Refrain from using ColdCure® within the 4 hours following your 20 minute BFST® treatment. This will counteract the treatment. If necessary, use the ColdCure® wrap for pain control, then follow up with another BFST® treatment. Increase the effectiveness of your ColdCure® treatments by attaching an Accessory Strap to any ColdCure® wrap. The Accessory Strap will provide you with additional compression and this means maximum pain and swelling relief. Click here to see in Shop! The Blood Flow Stimulation Therapy (BFST®) Wrap is designed to promote blood flow in injured tissue below the dermal (fat and skin) layer. Utilizing our patented Energy Web®, specially controlled EMR energy envelops the affected body part and stimulates blood flow in the soft tissue deep beneath the skin. The resulting blood flow brings oxygen and nutrient rich blood to the injured area, accelerating the healing process. This goes far beyond a cold laser's ability. This is not a heating pad. Heating pads only heat the surface of the skin. Heating the surface of the skin does nothing to heal the damaged tissue below the dermal layer. BFST® penetrates deep below the skin to stimulate blood flow in the area of injury and this creates an ideal environment for healing. The difference is significant. As an FDA Registered Medical Device, the BFST® wrap is suitable and completely safe for in-home use. Home use reduces in-clinic medical costs and further speeds up healing times. The Energy Web® of the BFST® device is enclosed in a soft, comfortable neoprene wrap. The wrap shapes the Energy Web® to mold around the entire affected body part to ensure that there is an even distribution of energy over the entire injury. The wrap is opened and closed using attached Velcro® straps that guarantee a perfect fit. As well, the wrap and unwrap design allows for easy wrapping of a tender, painful injury. After treatment, the wrap does not need to be removed. The straps can be further tightened to provide snug support and protection for the injury. The device disconnects at the wrap from the power supply and controller so you are free to move about your home when not receiving treatment, while still wearing the wrap for support and comfort. Note from KB WebMaster - The text below is primarily intended to assist with Google properly classifying this page content. To learn more about our products please visit our website.<br>Cold Laser therapy does not help injuries. BFST is more powerful than cold laser therapy. BFST covers more area than a cold laser. LLLT treatments are not effective. 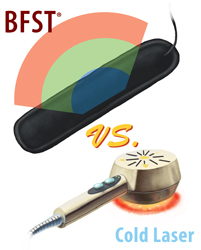 Use BFST instead of Cold Laser to treat injuries. Cold lasers claim to relieve pain, but do not. ColdCure wraps relieve pain better than cold lasers. There's no doubt that to heal quickly you need BFST treatments. Coldcure will help with pain. You can cure pain and an injury with BFST and coldcure technology. The best injury treatment is BFST. The best pain treatment is coldcure. These wraps are incredible. They feel comfortable. They work. So, if you want to heal your injury quickly, you need BFST. If you want to treat pain you need coldcure.